Reel 6: What is The Iron Lady? Let us be frank: the film has publicised itself as a film about the political life of Margaret Thatcher, trading on her struggle to become Britain’s first female prime minister and referencing famous events from her administration, such as the Falklands War. However, there isn’t much of this in the finished film and her political life is dealt with very thinly. So, strangely, it doesn’t feel like a film about Margaret Thatcher’s political life. What you do get is an awful lot of Thatcher as an old woman. Now, dementia and old age is of course a very powerful subject and has been covered very poignantly by many films. However, Margaret Thatcher’s dementia is pretty much the least interesting thing about her. It certainly does nothing to enhance our understanding of her extraordinary achievements by looking at it through the perspective of a fairly deranged old person. The major focus on this then is very curious indeed. So, is it a film about dementia in the same way that Iris perhaps was? Well, no. It doesn’t really say anything about the condition at all. The mental disintegration is just there, and one does get the sense that one is being most definitely manipulated by its use into sympathising with the most divisive post-war Prime Minister. It is hard to see the use of the condition as, at best, lazy or, at worst, cynical. At the end of the film, the very elderly Margaret, with Denis long dead and her children living their own lives, stands alone in her kitchen washing up a tea cup and hearing the sounds of the family life that she never really had, as she imagines Denis starting up the car and the children laughing in the garden. There is a subtext to that moment which is incredibly regressive. 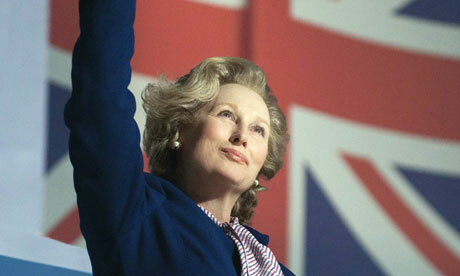 For a film which has actually glossed over Thatcher’s political life and failed to give it due credit for the extraordinary and important achievement it was for women in Britain to end on a scene which seems to suggest, in part, that, when all was said and done, she rather wished she had stayed at home and done the washing up is just insulting. A harsh reading of the film? Perhaps, but it is possible given how weakly it dealt with its central character and her legacy. That central character is brilliantly performed by Meryl Streep, and she deserves the Oscar absolutely, but it is a failure of a film which attempts to be everything and winds up being nothing. I wonder whether you read too much into it. Just because she "imagines Denis (not Dennis, as you write) starting up the car and the children laughing in the garden", does not necessarily mean that she regrets that she gave up an ordinary life for an extraordinary one. The defining characteristic of Lady Thatcher has always been her unflagging determination and I doubt she ever seriously regretted her life choices. She was/is simply not that sort of person.